Diffraction-limited is a term that is often bandied around in the context of lens performance so its time to look at what it really means. Before that, dash off and get a current copy of What Digital Camera (March 2010) because youll want to look at one of the pictures inside. Let’s start by getting rid of the lie you’ve probably been told since you were at primary school: light doesn’t really travel in straight lines – at least, not the same straight line all of the time. Yes, shadows and silhouettes are great fun and rely on the straight-line nature of light but those are macroscopic effects and light is actually a vastly sub-microscopic thing. When light passes an edge it changes direction according to a phenomenon called diffraction. This has been known for a long time and can be seen with the naked eye when water waves go past an obstacle (although that’s a bit misleading because water waves travel through water whereas light waves don’t travel through anything tangible). The reason for the change in direction (“bending”) was first suggested by the seventeenth-century Dutch physicist Christiaan Huygens, who said that every point on a wavefront is a source for the wave as it advances. Interested readers can do an online search to find out more about Huygens’ work. When light goes through an aperture it bends in multiple directions and produces an interference pattern: this means the shadow of a circular aperture is not circular but rather comprises a set of light and dark rings that are bigger than the aperture – and get even bigger as the aperture gets smaller. This is the effect that is usually meant when people talk about diffraction-limited lens performance. It means that when you try to make things very small they actually start to get larger again, so setting the smallest aperture can be counter-productive if you are trying to see small detail in an image. Unfortunately, the story doesn’t stop there. In the real world, lens apertures are not truly circular and diffraction occurs not only in rings but also in “spikes” that are caused by the flat edges that move together to give different apertures in a variable-aperture lens. This is a far more obvious effect than that caused by circular diffraction. So in the real world, diffraction-limited lens performance refers both to circular diffraction and to starburst effects caused by flat-edge diffraction. Interestingly, it is also possible to focus an image using diffraction but that story will have to wait for another occasion. Looking towards the Palace of Westminster from Lambeth. 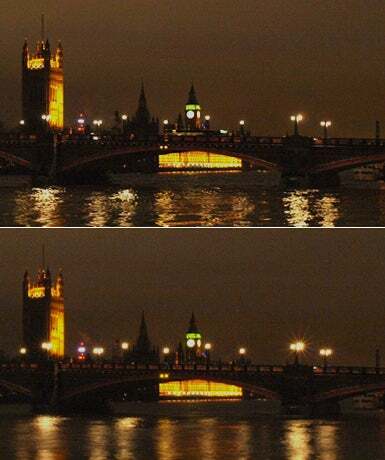 In a wide-aperture picture (top section) the lights are clearly circular but when the lens is stopped-down they exhibit a starburst effect (bottom section) that is particular obvious around one of the bridge’s street-lights, right of centre. Photograph (c) Jon Tarrant.